The old joke goes, "How do I get to Carnegie Hall?" Answer: "Practice." Yes, practice is important and demanding. Merriam-Webster defines it as being professionally engaged, as in to practice medicine, or to perform or work at repeatedly so as to become proficient. For those who become private practitioners in therapy, it calls for the practice of more than just clinical skills. Private practitioners are multitalented individuals who in addition to being skilled clinicians must maintain business and marketing skills, possess entrepreneurial talent, and cultivate technological savvy. 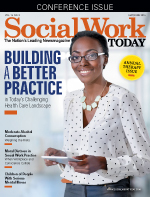 Not all social workers choose a private practice specialty, but for those who do, there are myriad considerations, especially in this challenging health care environment. Our cover story, "Building a Better Practice," tackles many of those concerns. One of the major challenges among private practitioners is the struggle for a sole practitioner and small group practices to operate under new and increasingly complex billing and documentation requirements from third-party payers while maintaining solid pay rates. Many therapists are dropping solo practices to join groups as a result of health care reform. And some predict that consolidation of mental health providers is coming next. It appears that private practitioners must be ready for anything; it is a fast-evolving field in an even faster-evolving health care landscape. Amidst all the changes happening in health care, a major determination for every private practitioner is whether or not to take health insurance. There is no right or wrong answer, but it is clear that whether you choose to take insurance or not, a solo practitioner or a group practice must stay informed on the latest state and federal policies. Additionally, because insurance and billing procedures have become so complex, technological savvy and the selection of an electronic health record that is right for you and your practice are key. Read about the challenges facing today's clinicians in building better private practices—and the techniques they're using to perfect their roles as businesspeople, marketers, leaders, and entrepreneurs—on page 10.